Seeing a black hole allows us to test Einstein’s theory of General Relativity in extreme gravity. It predicts a black hole will cast a circular shadow on the bright, super-heated material around it. That’s what this image of M87 reveals. The diffuse bright light is the “accretion disk” – swirling masses of matter orbiting the black hole chaotically. The bottom is brighter: that’s an effect of material orbiting the black hole moving in a clockwise direction such that it looks like it’s moving towards us. This shadow is about five times larger than the actual event horizon because the black hole’s tremendous gravity warps the space-time, causing light to bend around its core in unstable orbit (& eventually get sucked in). If you were floating in front of this black hole, you’d be 1- dead (very quickly) but 2-able to see the back of your own head as some light bends around the event horizon and back to your eyes! For scale, this shadow is about as small as an orange on the moon would appear to us from Earth. It took 8 telescopes at 6 sites across the globe acting as a virtual “Earth-sized telescope” to patch together this image! The data were collected in 2017, and the researchers have been analyzing and triple-checking their work since. Since the size and shape of the shadow depend on the black hole’s mass and (to a lesser extent) its spin, researchers determined the mass of M87’s supermassive black hole to be 6.5-billion times that of our Sun (with an uncertainty of 0.7 billion solar masses). So far the data match predictions and once again give support for Einstein’s theory of general relativity, but there’s still lots more to learn! Next, the EHT is pointing its radio telescopes at Sagittarius A*, the supermassive black hole at the center of our own spiral home galaxy, the Milky Way. It’s much closer to us than M87’s black hole but smaller and much less active, so it’ll be tough: positioned about 26,000 light-years away, Sagittarius A* is small enough that it appears about the same size in the sky as the much farther M87. The estimated mass of Sagittarius A* to be 2.6 ± 0.2 million solar masses, way smaller than M87’s supermassive black hole. 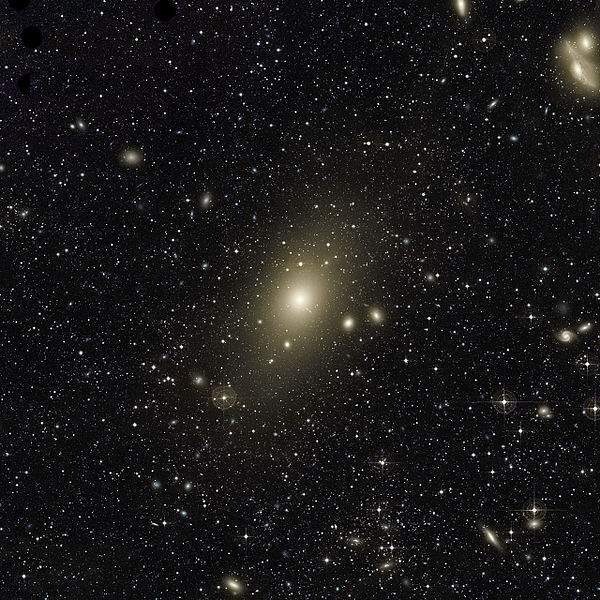 One of the brightest radio sources in the sky, Messier 87 (also known as Virgo A or NGC 4486, generally abbreviated to M87) is a supergiant elliptical galaxy in the constellation Virgo. It is also a popular target for both amateur and professional astronomers. It is located about 16.4 million parsecs (53 million light-years) from Earth. M87 is discovered by the French astronomer Charles Messier (26 June 1730 – 12 April 1817) in 1781 and cataloged it as a nebulous feature while searching for objects that would otherwise confuse comet hunters. He is known for publishing an astronomical catalog consisting of 110 nebulae and star clusters, which came to be known as the Messier objects. M87’s galactic envelope extends to a radius of about 150 kiloparsecs (490 thousand light-years), where it is truncated—possibly by an encounter with another galaxy. In general relativity, an event horizon (EH) is a region in spacetime beyond which events cannot affect an outside observer. In layman’s terms, it is defined as the shell of “points of no return”, i.e., the boundary at which the gravitational pull of a massive object becomes so great as to make escape impossible. An event horizon is most commonly associated with black holes. Light emitted from inside the event horizon can never reach the outside observer. Likewise, any object approaching the horizon from the observer’s side appears to slow down and never quite pass through the horizon, with its image becoming more and more redshifted as time elapses. This means that the wavelength of the light emitted from the object is getting longer as the object moves away from the observer. The travelling object, however, experiences no strange effects and does, in fact, pass through the horizon in a finite amount of proper time.